Herbal Teas are wonderful beauty boosters, healers and can offer essential nutrients for your wellbeing. I am a huge fan of herbal teas and our cupboard is usually well stocked to the brim with all sorts of teas... Some for calming, some for uplifting, some for the morning, some for the night, some to go with something sweet, some for cleansing & detoxifying... the list goes on! I already told you in my Postpartum Video about how much I love my Dandy Chai with plant milk as a nourishing & balancing alternative to coffee. I have also been drinking herbal nursing teas after Faye was born, which are formulated especially for nursing Mums and now I am enjoying a variety. I also usually serve some to my clients! I have witnessed many times how effective tea is in improving the skin. I prefer loose teas to tea bags, as there is #zerowaste ! Less packaging is better for the environment. It's also nice to see the actual herbs, they usually look very pretty :) and often (not always) the quality of loose teas is higher. So here are some of my favourites, both made by local Sydney businesses! All formulated by Naturopath Anna Mitsios, these powerful concoctions really do what they say on the bag. They all have the benefit of also tasting really nice too. The range covers all skin and many health concerns from ageing to acne. I have previously written about the ones I drank in the lead up to our wedding and for clear skin here. 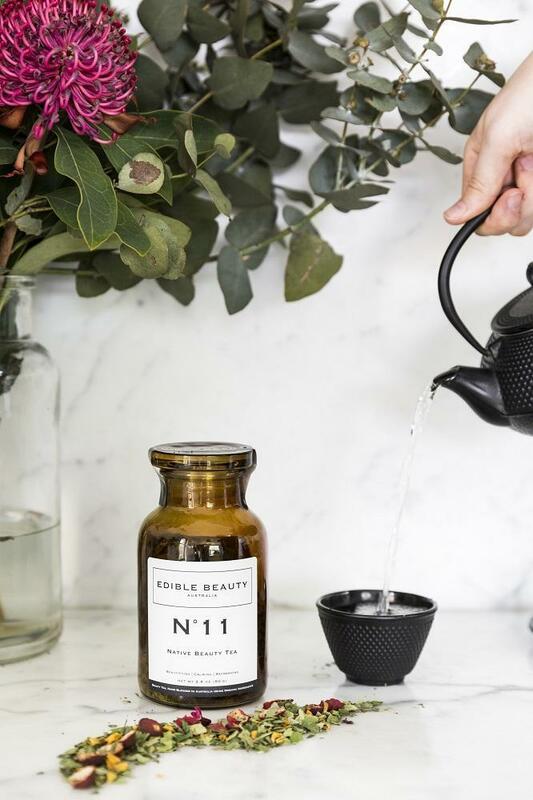 I am all about No.11 right now, (which is also breastfeeding friendly), a beauty tea packed with anti-oxidants and collagen-boosters but the real beauty is in its story and the wonderful taste. This tea has Guradj as the main ingredient, a Native Australian Tea, which has been used by Aboriginal communities for centuries as a medicinal and welcoming drink. I have never heard about it before, but it sure is tasty. It's a perfect Summer tea, as it tastes amazing iced and is very refreshing! Traditionally, wise native ‘Gurạdji Men’ dispensed the Gurạdji leaf. They were the holders of knowledge, tradition and rules. When someone visited another clan, the Gurạdji Man was consulted for permission to access that clan’s Country. They shared Gurạdji in a ceremony, which had a mild analgesic and great relaxing effect. Medicinally, the leaves were used for analgesic and anti-bacterial use. They were chewed to relieve toothache, steeped in water and sipped to relieve pain or nausea, and made into a paste that was applied to wounds or injuries to reduce inflammation and help in the healing process. Gurạdji tea is sourced from a traditional Guringai family, LORE Australia, that sustainably wild-harvests the groves. At every stage of the harvesting process LORE practices personal connection, respect and intent with the land and communities in which they operate. Is a local tea brand which specialises in detoxing & weight loss. While I am breastfeeding weight loss is not my concern right now but I have tasted and tried the Bondi Beach Tea Co teas and the ingredients are a well formulated! These teas aren't recommended to be used during pregnancy & breastfeeding without confirming with your healthcare provider first! If fitness & weight loss are your main concerns give these ones a go, they are all natural and free of any laxatives. They state to use organic ingredients when available. I wish they could clarify and get certified organic ingredients. This has been formulated to speed up metabolism, is packed with antioxidant-enriched ingredients that are energy uplifters, enhance the body’s natural detoxifying powers, reduce inflammation, and promote healthy weight. This one contains green tea and is best to be consumed in the morning. It energises gently with Yerba Mate & Green Tea and contains natural caffeine. A mixture of traditional herbs known for their medicinal values this tea helps to keep your digestion on track, detoxify & help to lower blood sugar and curb sweet cravings! It tastes delicious and looks very pretty with its rose petals too. This tea is a sweet relaxing one for the evening. It doesn't contain any caffeine. It's best to look for organic ingredients to avoid pesticides & herbicides in your brew. As herbs can be potent & powerful always check with your healthcare provider if you are pregnant or nursing.